That said, I am more than a little wary of centralizing Democratic power in the Executive Branch. The Senate has now lost Biden and Clinton. VP-Elect Biden has no particular agenda other than to advise Obama. The Clinton Global Initiative can no longer convene world leaders around social change initiatives. Et cetera. I’ve read that Obama is a leader who selects skilled deputies and then gives them the freedom to do good work. Some of his transition choices demonstrate this possibility. At the same time, who remains to provide a healthy check on and challenging support system for his agenda? Yes, yes, I know we have Waxman in a good spot, and in theory Pelosi and Reid will grow a backbone and drive some liberal legislation. But this reminds me of Obama’s efforts to sideline 527s during the general election, and direct all fundraising to his campaign. I find myself in an interesting position as a Clinton primary supporter; I have tremendous respect for Obama, am thrilled with his win, and like him and feel more comfortable with his leadership in large part because his most irritating fauxgressive supporters have steam coming out of their ears at some of his choices – and are perhaps crying softly into their pillows at night over the betrayal. The stakes could not be higher for the Obama Administration, and I’m cautiously optimistic that in four years we will be living in a better world due to his team’s leadership. If he fails, he’s bringing a lot of good names – and their own well-established networks and infrastructures – down with him. And in the event of a 1994-esque GOP renaissance (though I don’t see how that’s possible in 2 years), I wonder who’s dispersed through the system to beat back such an uprising. We’re hosting Thanksgiving this year (first time!) and keeping it small (just my mom and stepdad). I am knee deep in grading papers that I’ve been blowing off for two weeks. Great. It appears what kind of stuffing to make is the big decision of the day. Wishing you all a wonderful, happy and healthy holiday. The New York Times reports that intakes at Broward County, FL one-stop career centers are up 60% from one year ago, with people queuing up for one-third fewer jobs. 40% more families are now on public assistance. Welcome to the “emergency rooms” of The Bush Economy, where desperate neighbors meet overwhelmed service providers, and anxieties about putting food on the table and gifts under the Christmas tree drown out optimism over Obama’s recent victory. One-stops are the decade-old delivery system for numerous federal employment and public assistance programs for unemployed and low-income individuals. Since 2000, Bush has slashed one-stop funding by 14%, leaving mainly black and immigrant Americans with fewer services in a time of rapidly rising need. Attorney-blogger TChris proposes that the Obama Administration repair this frayed social safety net as part of its planned infrastructure investment. I agree. I’d like to see Obama restore funding to one-stops, further extend unemployment benefits, increase funding and eligibility for food stamps and heating assistance, expand S-CHIP coverage for low-income kids, and expand the Earned Income Tax Credit so low-wage workers have more money in their pockets this spring. And I haven’t even gotten to the foreclosure and state budget crises in this holiday wish list! The percentage of individuals living in poverty could grow by 25% during the first Obama Administration. (Stimulus be damned!) Yet, no doubt President “the E/R = universal healthcare” Bush is giving thanks for his smoothly functioning economy this week. I’m grateful he’s finally on his way out, though our work remains – including this Thanksgiving. UPDATE [11/24; 10:50 pm]: desmoinesdem also notices something suspect about the gender analyzer, and collects all the women political bloggers incorrectly assumed to be men, as well as uncovers the assumptions behind the logic used. Cute. I’d be more aghast if I weren’t so freaked by the sheer bias involved. It’s times like this that I wish stores were open late so I could go shopping; nothing like a little retail therapy to cheer me up! SIGH. Gender Analyzer is 93% sure that The RP is written by a man. I think it thinks women bloggers = mommy bloggers who only talk about kids, relationships, parenting and shoes. That’s my hunch, anyway. I am also a Thinker (INTP). Well, at least we got that right. 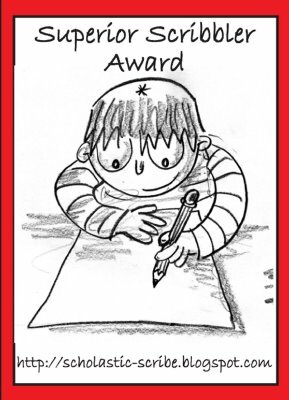 Red Queen‘s so proud of me for my gender-bending brainy goodness that she’s given me an award! Sniffle! I’m honored!! I’d like to thank the Academy, and my man, and my parents, and my fellow bloggers, and my junior high principal for announcing my name over the loudspeaker the day I won the choice of a stereo vs. a remote-control car in some reading contest or something in the 8th grade. I’ll never forget how good it felt to be the center of attention and to win stuff, and I vowed from that moment forward to keep attention-seeking and have been waiting my whole life for a moment as special as this. G*d bless the U.S.A.! * Each Superior Scribbler must in turn pass The Award on to 5 most-deserving Bloggy Friends. * Each Superior Scribbler must link to the author & the name of the blog from whom he/she has received The Award. * Each Superior Scribbler must display The Award on his/her blog, and link to This Post, which explains The Award. * Each Blogger who wins The Superior Scribbler Award must visit this post and add his/her name to the Mr. Linky List. That way, we’ll be able to keep up-to-date on everyone who receives This Prestigious Honor! * Each Superior Scribbler must post these rules on his/her blog. Yes, yes. So I nominate NYC Weboy – he is certainly gayer, and who can compete with that? And I nominate Liss, for Shakesville now and evermore. I nominate pocochina – nobody RANTS better than her. I nominate Pizza Diavola – if anyone could single-handedly overturn Prop 8, it’d be her. And I nominate G.D. at PostBougie, for blogrolling me and for sporting such a stellar blog design. What discriminating taste! My competitive heart typically scorns the “we’re all winners!” attitude, but tonight, the seven of us are. Especially me. I can make it anywhere! But these kids have left me homeless – guest-room homeless, that is. As my friends turn into moms and dads, their spare bedrooms become kids’ bedrooms; pull-out sofas and futons are relegated to basements (have you heard the patter of little feet overhead??) or stashed in corner spaces without doors. My best friends in the Bronx recently converted the “spare” bedroom fully into the office & playroom; my best friend in DC is converting “my” cheery, yellow guest room into a baby’s room by this spring. Isn’t it sad for Redstar, no longer finding the accommodations to her liking when she takes her appreciative, it’s-been-awhile-and-I’m-passing-through show on the road? Tonight turned out to be a particularly precarious evening. My old college roommate now on Long Island has 2 kids under 2, and they sleep through the night sporadically. My Upper East Side cousin’s fiance is on-call overnight tonight, and likely to be delivering medical instructions over the phone from their living room until the wee hours. And I’m operating on a sleep deficit after multiple conference nights and a pull-out-sofa-&-ill-child-up-till-all-hours experience last night. Fortunately, this is NY, where a guy I dated once (briefly) believed that you could get anything for a dime. 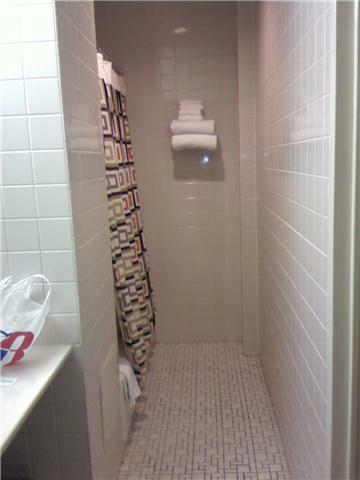 This is a budget hotel undergoing “renovations,” and offering clean rooms, private baths (or shared), free wireless internet, and an extremely convenient location. I left the L.I. suburbs late this afternoon with my PC over my shoulder and dragging my suitcase behind me. An hour later I was coming up out of the subway in Times Square, feeling like a movie heroine straight out of Kansas arriving in the big city, alone and brave, ready to sing/dance/act her way to fame and fortune. 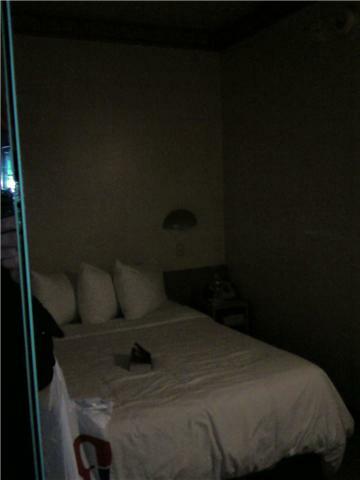 The “renovations” in my hotel turn out to be some urn-like sculptures in the lobby, some electronica music piped over the speakers, a mod shower curtain, and clean white linens that contrast with the gray institutional carpet with the iron burn in it in my lockbox of a room. But noisy neighbors be damned! I’m so amused with my self-imposed exile to the frenzied heart of the city that I keep smiling alone in my room, enjoying the solitude within these four walls. I moved to NY in July 1997 at 21, with a job but no place to live. I stayed in the same L.I. suburb that week too, then crashing with a friend who was living with her mom until she figured out what came next after college. 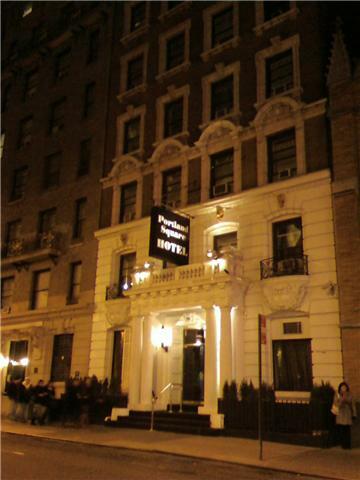 On Thursday night of that first, long week, in order to go out for drinks without worrying about trains, I checked into a budget hotel in Murray Hill even more cramped than this one. I vaguely recall a twin bed, and real fear but elation staying alone in this new, enormous, overwhelming city. It feels so familiar yet newly adventurous now, seeking refuge from toddlers in a neighborhood I quickly learned to avoid and scorn as a “New Yorker.” In my final years in the city, drinking in the Irish bars over here with a friend and her actor-husband’s crowd gave me a new appreciation for those whose livelihoods depend on this tourist mecca (and yes, one set of my parents are those that like to see “a show” when they come to NY – musicals only, please). But it was always about them. Tonight, I’m playing the part of Ana. Don’t forget – you knew me when. Flew in last night from New Orleans, am on Long Island, headed to Manhattan in a few hours. i’m fatigued from the travel and the less than ideal slumber conditions, so talk amongst yourselves in my absence. Annoying people at the airport who use too many bins going through security. If your stuff’s in a bag, the bag does not need to go in a bin!!! Enough with the bins already!! If Sen. Clinton leaves the Senate to become Secretary of State, she leaves behind 16 fellow women Senators (among 82 men) and joins 25 women foreign ministers around the world (5 of whom also came to the post this year). Assuming the 180 or so country governments worldwide all have this position, Clinton leaves one boys club for another. Forgive me for not being totally jazzed about this development…yet. Like many former Clinton supporters, I was enjoying Clinton’s late- and post-primary aggressiveness on reproductive rights and economic justice. I fancied her hanging out in the Senate alongside Sen. Murray and other allies, fighting the good fight for women, children, families, the uninsured and those at risk for losing their homes and jobs. Count me in as one of many indulging in the idea that she’d be the next “liberal lion” of the Senate. Turns out, Uncle Teddy isn’t quite ready to give up the title just yet, and she lacks the seniority (star power just doesn’t cut it, unless you’re Obama) to really rise to the occasion anyway. Bummer. Believe me, I realize Clinton and her sixteen women colleagues weren’t a monolith or a voting bloc, nor do I expect them to be strictly due to their gender. Duh. I also know that the US is no role model in terms of gender parity in politics, and that our SoS will conduct business in countries with far more impressive women’s representation than ours. It’s just…I was just getting used to Clinton in her new role as the prominent-elected-leader-with-nothing-to-lose-by-being-an-outspoken-powerhouse-for-women’s-rights-and-economic-security Senator from NY. Or some such vision. (YMMV.) I liked it. But, in our new post-partisan domestic reality, it strikes me that Clinton needs a stronger foil than she’d find in Obama – what could be the equivalent of her partisan rancor towards Bush now? It’s hard for me to see a similar soapbox for Clinton in an Obama Administration, given how so many of her prominent senior male colleagues rallied around Obama (yes, Kennedy and Kerry, I’m talking to you). There’s no real space in the Obama-Biden 111th Congress for her to step out of line, if you will; I have no idea what the rules are for Dem attack dogs in the face of a small but hostile GOP minority, Rahmbo notwithstanding. 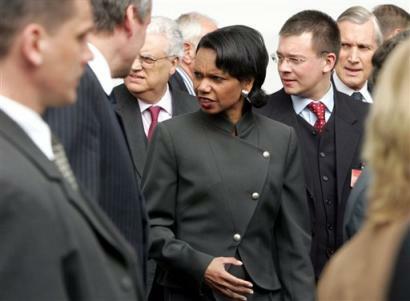 Despite her and Obama’s mutual calls for renewed diplomacy and engagement with the world, I have a hard time visualizing her not negotiating arms treaties (or withdrawals) or various strategies of aggression or other militiarized concerns. (Yes, foreign policy is not my area.) It will take time for me to wrap my head around her new job and its major issue areas and the new cohort of dudes she’ll be running in. But I do have faith that given her well-regarded work as a First Lady, her selection as SoS indicates women’s, children’s, and human development will be priorities in an Obama Administration. Which is a potential change in scope and focus that really excites me. And as an added bonus for Sen. Clinton and President-Elect Obama, should she become SoS, she’s got that helpful wife spouse to support our diplomatic efforts via her his pet projects that showcase the plight of special populations around the world. Every elected leader should be so lucky!